UCD won the Intermediate 8+ title at the 2017 National Championships for the first time since 2008. UCD Ladies Boat Club added the Senior 2- and joined up with Old Collegians to take home the Senior 8+, while Old Collegians themselves had wins in Senior 1x and Senior 2x. The club is mourning the passing of past Captain Gerry Buckley who died on Saturday morning, 8th July. 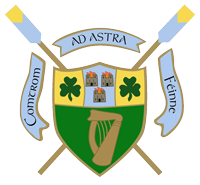 UCD won the Leander Trophy for Mens Senior 8+ at Cork Regatta for the first time since 1971 with wins also coming in Mens Intermediate 8+ and Mens Club 2 8+. Nearly 30 UCD athletes competed at London Met, testing various combinations and getting good racing over the weekend. Crews battled through wind and rain in Blessington for Dublin Metropolitan Regatta, with UCD taking home wins for Senior 4+, Intermediate 8+ and Novice 8+. Paul won the ‘Dr. Tony O’Neill Sportsperson of the Year’ award while Martin was presented with the inaugural Bank of Ireland ‘Graduate of the Year’ award. The club was saddened to hear of the death of Helen Carty (née Moloney), wife of 1962-63 Captain Austin Carty, last Sunday. Although some events were curtailed by a lack of entries the centrepiece was again UCD vs Trinity in the Mens Senior 8+, with College prevailing by 2 1/4 lengths. UCD’s Senior and Intermediate Eights followed up their Wylie Cup success by taking home the titles on offer at Skibbereen Regatta over the weekend. The Senior 8+ and Intermediate 8+ won convincingly to send the Wylie back to College for the first time since 2014 and move the club to 2nd in the overall standings.